The harvesting of walnuts is held each year between September and November. It begins when the husk is crackring and that the shell is dark and damp. Walnut trees are then shaken so that walnuts fall on the ground and they are then picked up and washed before being dried, except of course for fresh walnuts. Concerning Grenoble walnuts with P.D.O.the date of harvesting is fixed by a commission of maturity made up of traders, directors, producers, and members of the CING, the INAO and the SENURA, and is formalized in a prefectoral Decree. The walnuts are harvested when mature, when the kernel is solid and peels easily. The internal central partition is completely brown for 80% of the concerned walnuts orchard . The drying process starts as soon as possible and in a maximum of 36 hours after harvest. Coopenoix and its member growers collect annually on average 6,000 tons of wanuts, from which, about 250 tons are fresh walnuts. 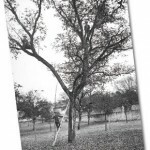 As early as 1927, members of the Federation of walnuts growers shake the branches with a pole picker, collect walnuts by hand, wash and sort carefully before making a first calibration to the dimensions specified by the board of directors of the Federation. Usually, walnuts are gathered by the communal Federation that delivers the walnuts by ox carts or "motor truck" to the Federation whose headquarters is located in the city "Albenc". Upon their arrival, the bags are weighted in front of a Union delegate and a member of the Board of Directors. The Federation rules in cash the Union representatives who pay in cash farmers in their area. This practice will continue until the 1960s where cheques replaced cash. It was only in the 1970s that growers are paid directly and individually forcing many of them to open a bank account for the first time. 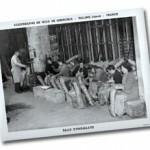 In 1929, the walnuts are delivered to Tullins' factory. Profesional workers remove walnuts of bad appearance. Walnuts are put in mechanical washers and then dryers before being calibrated mechanically. They are then packed in bags from 500g to 50kg before being shipped. 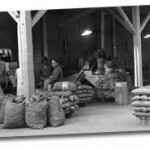 In 1932, 900 tons of walnuts are harvested from which 625 tons are sold in shells, 75 tons as fresh walnuts and 200 tons shelled. The highest harvests are recorded in 1952, 1972, 1982, and 2006. Between 1990 and 2000, production has increased from 1 600 to 3 300 tonnes. In 2008, COOPENOIX collects 6 000 tonnes of which 250 tons of fresh walnuts, 5,900 tonnes of dryed inshell walnuts and 150 tons of shelled walnuts. Apart from the fact that the area of harvesting (from Saint Marcellin to Moirans in 1936) expanded and extends today from the Drôme to the Savoy, the regular increase of the production is also due to better fertilization, the quality of treatments and the pruning of the walnut trees. In 1924, we planted 40 to 60 walnut trees per hectare and trees produced walnuts only after fifteen years. 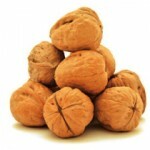 Today, a one-hectare orchard has more than a hundred trees which begin producing walnuts after only five years. Since 1980, the harvest is completely mechanized.